Again - back to our lives - have you ever seen a pattern of sin running the show in your life? I know I have in the past. It's a dangerous pattern to see taking place in our lives. It can lead to all kinds of pain and suffering for ourselves and those around us. If you are perhaps even in the midst of sin running the show in your life now, there is hope. There is confession and repentance. David does give us this example in Psalm 51. Psalm 51 David wrote after the events in chapter 11 took place with Bathsheba & Uriah. Psalm 51 is a powerful Psalm of confession and repentance. You may be at the point where you need to pray this Psalm to God now. I think each of us does well when we pray this Psalm to God regularly. We certainly may not be at the point where David was in chapter 11 - but, we likely have sin to confess to God - even right now. 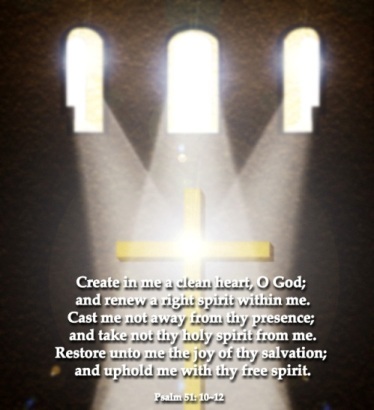 Click here if you'd like to pray Psalm 51 now. 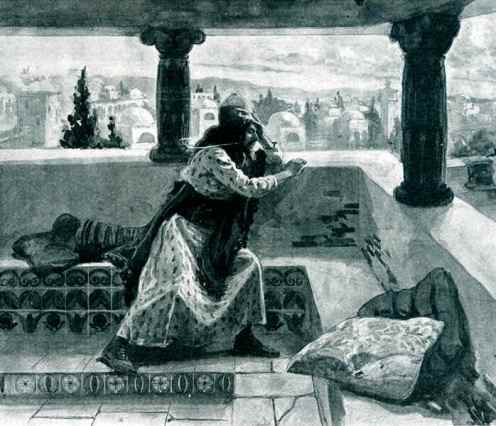 Bible.org's commentary on today's Second Samuel readings titled "David and Bathsheba" is at this link and "David and Uriah" is at this link. Bible.org's commentary on today's John readings titled "Abiding in Christ" is at this link and "The Christian and the World" is at this link. Psalms - Wow. I love Psalm 119 verse 54 today - "Your principles have been the music of my life throughout the years of my pilgrimage." What a beautiful metaphor - God's principles being the music of our lives through all our years as we are on our pilgrimage. Great stuff! How might God's principles actually become the music of your life? Do you think you'd need to be reading God's Word frequently to tune into his frequency? (did you catch that - frequently & frequency? :) I commend you for reading the Bible each day this year as we go through the One Year Bible. I pray you'll continue to read the Bible daily in all of your years to come. I pray God's principles are and will be the music of your life. Verse 59 today is a great verse for each of us to consider - "I pondered the direction of my life, and I turned to follow your statutes." Have you ever reached a mid-life or maybe even a quarter-life crisis where you pondered the direction of your life? Do you like the direction your life is heading now? Do you want to change that direction? Will you turn to follow God's way? God's Truth? 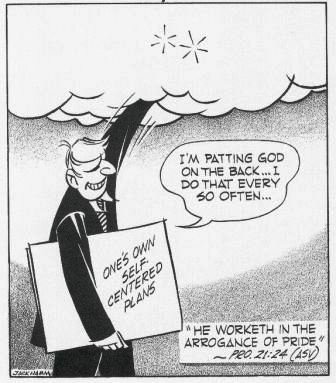 God's life for you? Do you believe that God's plans for you are so much bigger than any plans of your own that you could dream up on your own? Do you know our Agnus Dei? 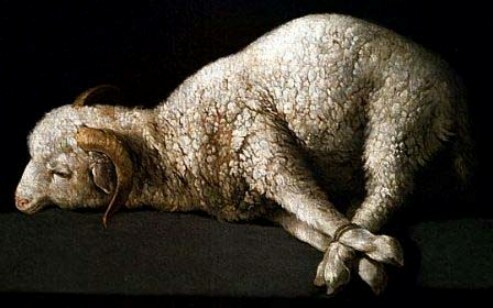 Click here and meet the Lamb of God! Comments from You & Questions of the Day: Based on today's Proverb, do you commit your work to God? Do you pray about your work and pray that it will be pleasing to God? Do you pray for others at your work? Do you pray for specific projects and meetings? Do you commit your work to God each and every day? If you do so, do you think your plans will succeed? Also, what verses or insights stand out to you in today's readings? Please post up by clicking on the "Comments" link below! Very tragic story regarding David. We see how not turning our eyes, leads to entertaining the thought. If we dont stop ourselves there, sin in our heart turns to action. Unrepented sinful action leads one on a downward spiral! David didnt wake up one day and think, hm, I think i'll commit adultery and then have her husband killed! Sin is slow, sneaky and starts with compromise, which leads to another compromise, and so on. Before you know it, you're in a big mess! Poor Uriah! I like wen Nathan gives David the parable of the man's one lamb slaughtered and David was outraged! : that man should die! So Nathan said, You are that man! Sin looks so much worse when other people are doing it! We are masters at justifying ourselves...deceiving ourselves. I love John 15! John v. 4 "Abide in Me, and I in you. 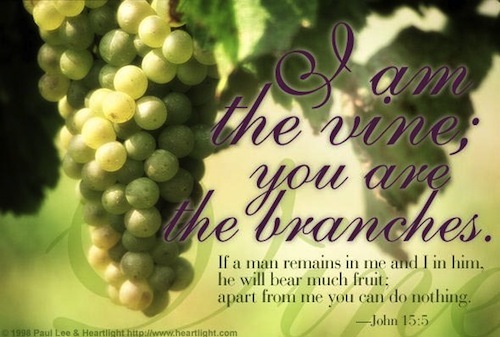 As the branch cannot bear fruit of itself, unless it abides in the vine, neither can you, unless you abide in Me." Sometimes we may try to fool ourselves into thinking we can bear fruit alone. We cant. how can we? ppl may try self-help methods, self-will, etc. but thats useless. we need to abide in Christ and Him in us. Fruit is a byproduct! It cannot be attained on its own, its a byproduct of abiding in Him. theres no way around that! "These things I have spoken to you, that My joy may remain in you, and that your joy may be full. "...i like this! "I have called you friends." Wow! we who belong to Him are no longer enemies of God, but His friends! reminds me of a song I like, "I am a friend of God, I am a friend of God, He calls me friend!" To willingly offer Your life"
I love Prov 16:1-3...So true!!!! all i can say is Amen and Amen!